After taking a hiatus for September, I’m back in the game for the Cottage Cooking Club, an on-line group working their way through Hugh Fearnley-Whittingstall’s River Cottage Veg. October is a month of transition. The weather makes a definite shift from summer to fall, and the harvest in my backyard garden and at local farms winds down. From the choices our group leader, Andrea, The Kitchen Lioness, selected for this month, I chose to make the most of the end-of-season tomatoes before wishing them farewell until next summer. 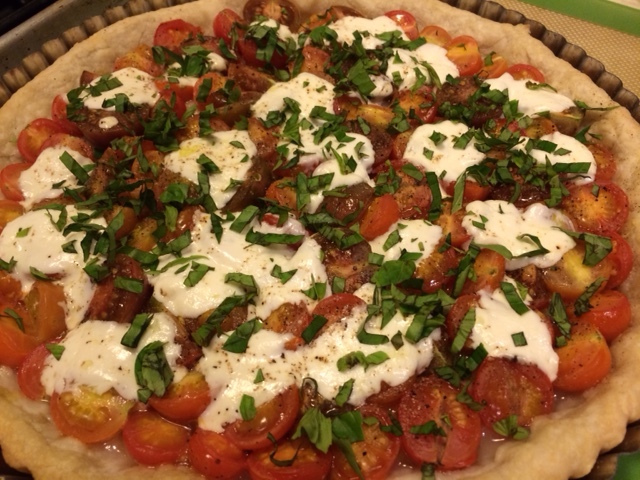 First up was the Tomato, Basil, and Mozzarella Tart. Anyone who follows my cooking knows that tarts are one of my favorite kinds of food to make. This recipe starts with puff pastry which is my nemesis. Well, store-bought puff pastry causes me trouble. Homemade rough puff pastry is much easier for me to deal when I have time to make it, which I didn’t this month. Instead, I used my favorite pastry crust recipe as the base for my tart. First, I sprinkled some slivered garlic on top of the partially-baked crust. Then, I covered it with halved cherry tomatoes fresh out of my garden, and scattered chunks of burrata on top. When the tart came out of the oven, I added the final touch: slivered basil leaves (the last of my garden crop). This tart screamed of all the best flavors of summer. Howard said it tasted like a pizza margherita, on pie crust. We also decided that I should have fully baked the crust before adding the toppings because the tomatoes’ juices make it a little bit soggy. 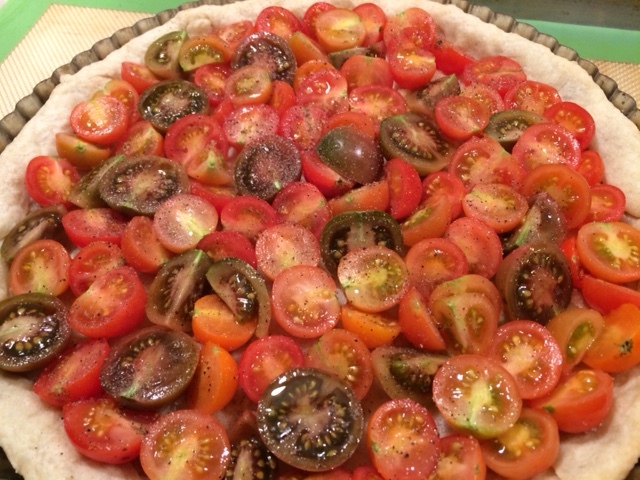 This is a tart that I will revisit earlier in the season next year because I can’t wait to make it again. 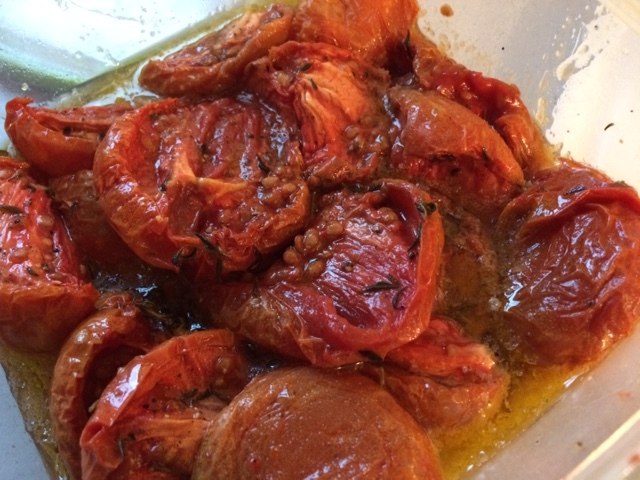 The other recipe I made was the Oven-Dried Tomatoes. I had admired these when other CCC members made them last summer. I bought a big basket of the last tomatoes from Wilson Farm and slow roasted as many tomatoes as fit on one large pan. 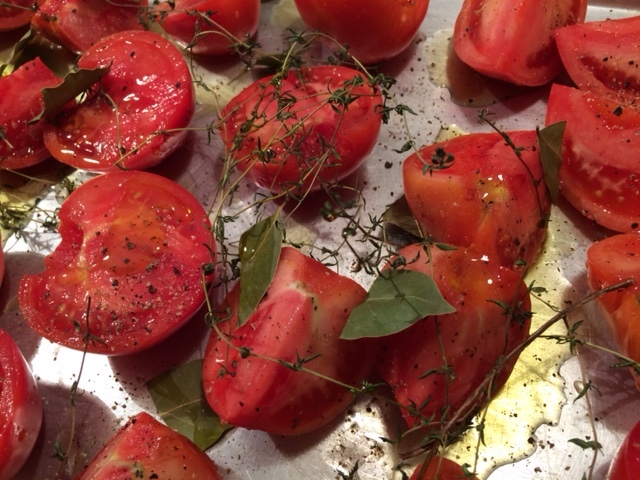 A friend had just given me a big bunch of thyme to dry, so I scattered a few on top of the tomatoes along with some broken bay leaves, olive oil, and salt and pepper. The recipe suggested they roast for 4 to 5 hours to be moistly dry. I opted not to remove the seeds, so for me, with all the extra moisture attached to the seeds and their gel, it took closer to 7 hours to get them to the right level of moist dryness. The long slow roast concentrated the tomato flavor, and they tasted (and smelled) amazing. Not having a plan on how to use them, I tossed them in more olive oil and put them in the fridge while I decided. After much thought, I decided to use my oven-dried tomatoes in a pan of baked ziti. Typically, cooked ziti is tossed with a marinara or other tomato sauce and them layered with mozzarella cheese before baking. Because I was using tomatoes instead of sauce, I took a slightly different approach. 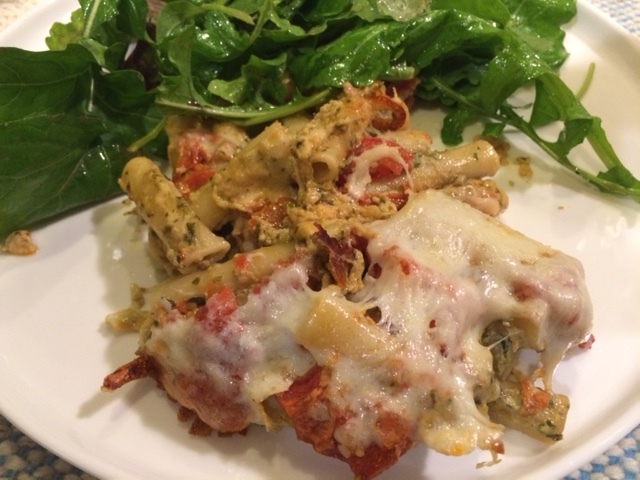 I tossed cooked ziti with a mixture of ricotta and pesto, then layered the noodles with coarsely chopped oven-dried tomatoes and a blend of mozzarella and Parmesan. We loved it! With this pair of tomato recipes behind me, I’m feeling ready to let the summer go and move on to winter squash, Brussels sprouts, cauliflower and broccoli. I’m glad to be back with the Cottage Cooking Club, and I’m excited for Andrea to reveal her delicious choices for enjoying autumn’s vegetables as we move into November. Boil a large pot of water, add about 1 Tbsp salt, and cook the pasta to just shy of al dente (about 9 minutes), then drain. Whisk together the ricotta and pesto until well blended. Combine the mozzarella and Parmesan. Stir the ricotta mixture into the drained pasta to coat evenly. In a large baking pan, layer half the pasta, half the tomatoes, and half the mozzarella/Parmesan. Repeat for a second layer. Bake for 30 minutes, until everything is bubbly.